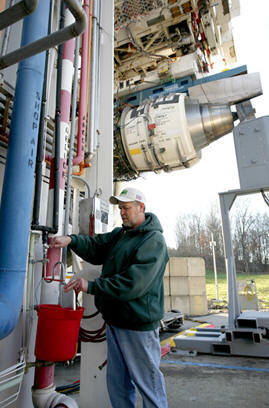 The chemistry that converts biomass to jet fuel has been around for many decades. But the chemical industry used the process mainly to manufacture soap and other goods based on fatty acids from plants, because jet fuel made from petroleum was cheaper. The math changed when the price of a gallon of oil crossed $100 in 2008. “That took the art of the possible to the art of the practical,” Epstein says. Epstein has been building GE jet engines for more than two decades, including combustion systems and fuel research. He says that aviation has been stuck with kerosene because of its chemical properties. It packs the right amount of energy per gallon and weight, and any replacement has to match that. “We won’t be flying on batteries, fuel cells or nuclear reactors any time soon,” Epstein says.